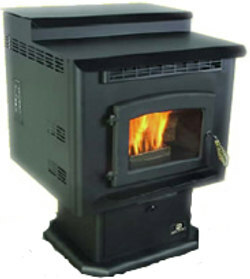 The Breckwell SP6000 is an agricultural looking stove, which might be appropriate as it burns corn as well as wood pellets. It's a rather old fashioned looking step top design which must be lit manually. See comments below. Capable of providing 50,000 btu, it has a 90 pound hopper capacity using corn. Wood pellets are slightly less dense so pellet capacity won't be as large. The brick effect fireback is standard on this stove, as is the large ashpan. The fuel stirrer that runs in the burn pot is needed for corn, but not for wood pellets. Min. Heat Output 13,000 btu. The minimum output is 13,000 btu. which is quite high. As this stove has no automatic igniter, the thermostat can only be used on high or low. If the stove is allowed to go out, it will have to be re-lit manually. It's recommended that the Breckwell SP6000 not be run for more than one or two hours at a time on the high heat setting to prevent damage. It should not be connected to a thermostat at high heat levels. Clean the burn pot and the fuel stirrer, wipe the glass. Vacuum ash from the interior chambers. If you would like to leave a review of the Breckwell SP6000, please use the form on the contact page.